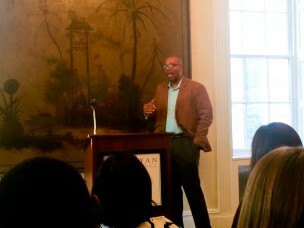 Yale University Professor Christopher Lebron gives lecture on race, equality, and the makeup of his new book. Assistant Professor of African American Studies and Philosophy at Yale University Christopher Lebron gave a lecture at the Russell House on Monday, Oct. 29 titled, “The Sense and Sensibility of Equality.” The lecture centered on topics from Lebron’s upcoming second book, which will be titled “From a Human Point of View: (Re)Imagining Racial Egalitarianism.” The Philosophy Department coordinated the lecture. Chair of the Philosophy Department Lori Gruen introduced the speaker as an academic who is both a political theorist and a racial studies expert. She emphasized the importance of his book, “The Color of Our Shame: Race and Justice in Our Time,” which received the First Book Prize by the American Political Science Association’s Foundations of Political Theory section. The focus of the book was how racist history undermines the possibility of democratic history. His new book is designed to focus on modern definitions of equality. “Lebron’s work is meant to deeply reshape how we value black humanity,” Gruen said. Lebron gave background on why he was motivated to study issues of racial identity in contemporary American politics. When he first went to graduate school at the Massachusetts Institute of Technology, Lebron said that he wanted to do work on global justice, determined not to write about race. One factor that influenced him was the denomination ‘Chocolate City,’ a name given to the section of the university where many of the black students lived. He also found himself unable to identify some of his personal struggles with the texts that he was reading for his courses. Lebron stated that racial inequality is an empirical fact of modern society and categorized many of the difficulties in combating this fundamental issue. Integral to Lebron’s definition of equality is the American people’s self-reflection about their relationship to each other as co-citizens sharing the same nation space. Lebron cited author James Baldwin’s two large complaints about democracy. The first is that of a democratic dissonance, which states that we can all be sharing the same nation and yet can individually be remarkably distant from one another. Another offshoot of this is democratic disaffection, which reflects the ways in which Americans can become disillusioned with the efficacy of democracy. The second tenet of the equality which he wants to define emphasizes overcoming bias and potentially harmful self-perceptions. Lebron believes that the human imagination can be used as as a tool of compassion and empathy for the world’s larger problems. Lebron gave the analogy of watching a play as a tool for describing the importance of imagination in defining racial equality. Lebron’s new book is meant to give a picture of the capacities required to perceive equality and the ways in which we can reimagine our citizenship based on this new view. To begin this section of the lecture, Lebron described a pickup game of basketball as a metaphor for democracy. One thing he found interesting about this type of game is that players are willing to cooperate quickly and effectively towards a common goal. In their implicit agreement to participate in the game, Lebron argues that pickup basketball players mimic citizens participating in democratic life. However, the major difference for Lebron, is that the game of basketball is inherently fair, whereas democracy is rigged. In a second analogy, Lebron detailed the story of a man named Darrell, who was pulled over while driving only because he was black, and who then proceeded to tell the story to a co-worker. This analogy was adapted from true events that involved his colleagues at Yale. Lebron argued that the co-worker has certain things that he ought to be do in response to hearing Darrell’s story. He clarified that when he says what the co-worker ‘ought to do,’ he is not suggesting that there is a set of actions or roles that the co-worker must carry out. He emphasized that the co-worker ought to be adaptive, flexible, and responsive as he hears Darrell’s testimony. He breaks the relationship between Darrell and his co-worker into three potential conceptual pairs: narrator and receptor, reasons and responsibility, and affect and compassion. Many students found this example intriguing and discussed it after the lecture. Rachel Fox ’16 spoke about the relevance of the anecdote to one of her courses. In the second half of his book, which is less developed as of now than the first half, Lebron hopes to revisit ideas about moral political theory and address the direction of the modern ethical gaze, large obstacles in racial inequality, and the ways in which our society blames certain demographic groups for their own misfortune or for the misfortune of others. The question and answer section was a stimulating portion of the lecture for many in attendance. Miles Cornwall ’15 reflected on the last portion of the lecture.